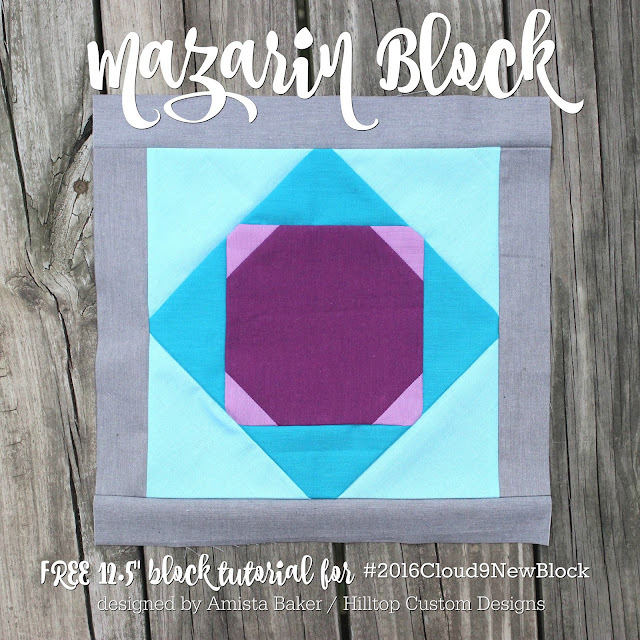 Hello and Welcome to the 2016 Cloud9 New Block Blog Hop! 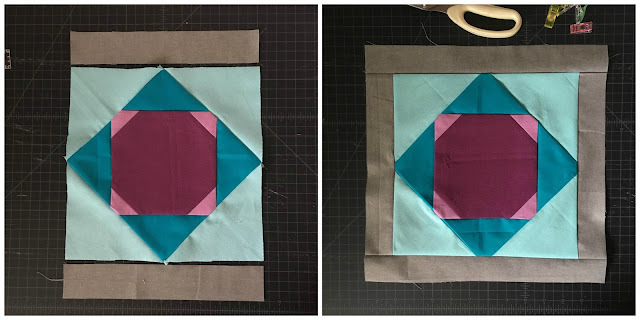 My name is Amista Baker and I've got a quick great looking block for you thats perfect for fussy cuts with a step-by-step photo tutorial! On down in the post you can see this block used in a quilt to see how versatile it is! 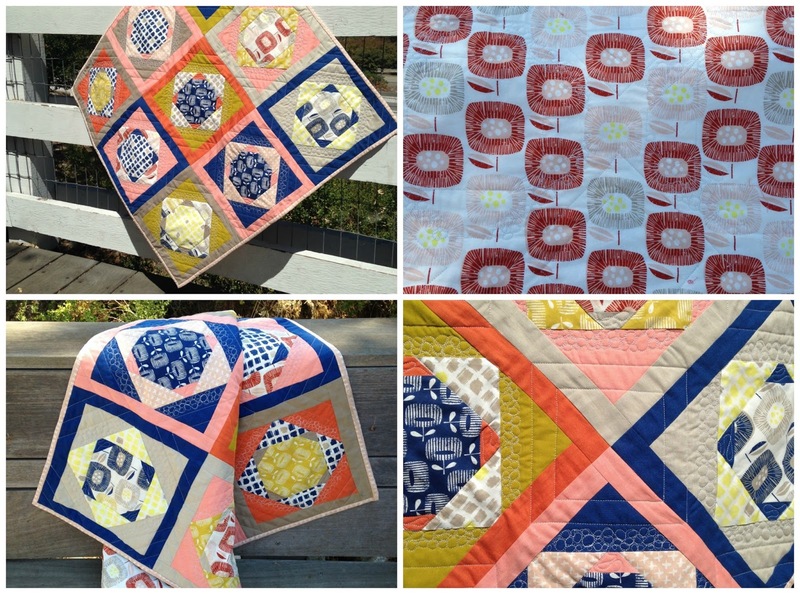 Cloud9 is generously sponsoring this New Block Blog Hop featuring their Organic Cirrus Solids. 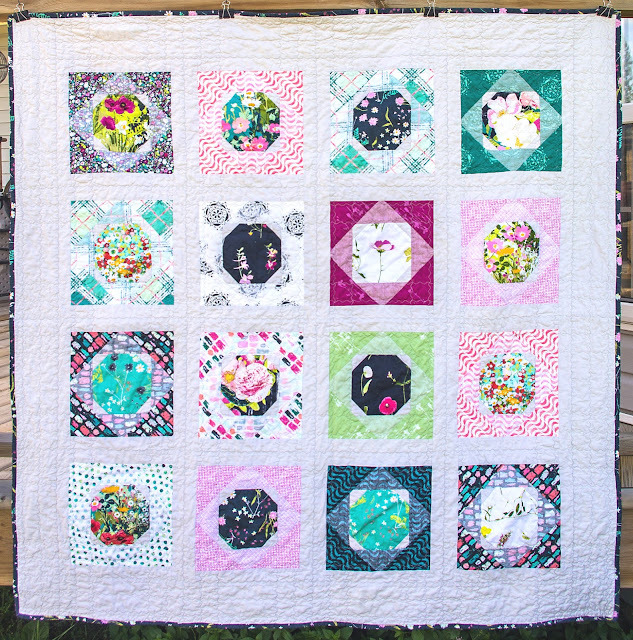 The blog hop hosts, Yvonne @Quilting Jetgirl, Cheryl @Meadow Mist Designs, and Stephanie @Late Night Quilter, have curated the “Berry Harvest” bundle, and Cloud9 is supplying each participant with a fat quarter bundle. Blocks made for the hop will be collected and made into quilts for donation. My block is named "Mazarin" after the lesser known diamond cut. I designed it myself after sketching some ideas on graph paper. Three or four designs in I came up with this block and I totally fell in love with it! The thing i love the most? It's nearly waste-free. Myself and my pattern testers did very very little trimming to these blocks, making the block extremely effective at using up as much of the fabric as necessary with little to no waste! I am always looking for that perfect block that allows you to use fussy cuts or prints you really want to showcase in the middle. This block does exactly that! I has a generous 6" center thats perfect for those prints you cant bear to cut up or really want to show off. Most of the outer corners are an easy "exploding" block technique, that if you have tried before you will totally fall in love with! I’ll be constructing this block using organic Cloud9 Cirrus Solids in Sky, Amazon, Lilac, Iris, and Shadow. I will refer to the blocks by color name, shown in the photo below. Basic sewing / quilting supplies required. You can download and save the free PDF block instructions here. 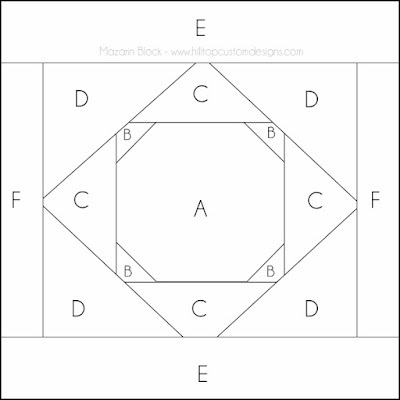 and you can also purchase the quilt pattern from My Shop or Craftsy for this block with detailed instructions, fabric requirement lists, and cutting requirements to make a 54" x 54" quilt. Feel free to use this blank coloring block for designing your blocks! Click to download. Lay your 6x6” Iris block down and put (1) 2” square Lilac block in each corner. Sew a diagonal line across all (4) Lilac blocks as shown below. 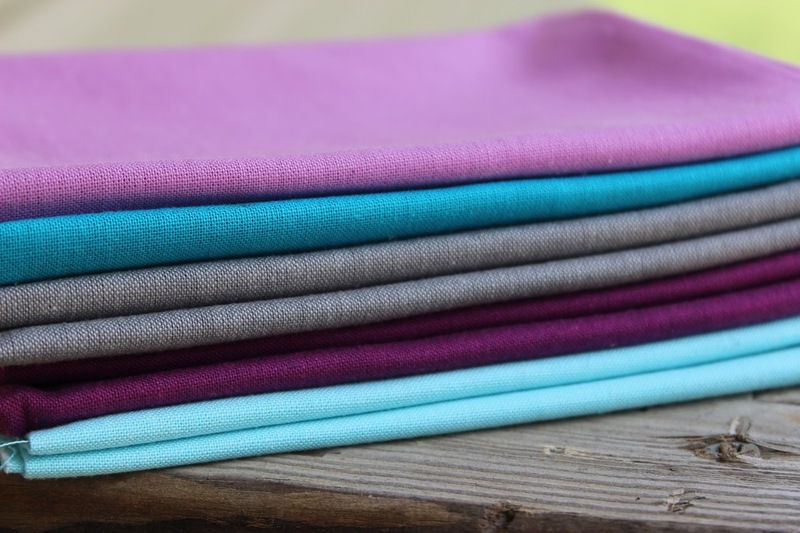 Trim off excess fabric while leaving a ¼” seam on each corner. Press seams open. Place ontop of your previously made block (using Lilac and Iris) and pin in place. Sew a ¼” seam around entire block. Using small, very sharp scissors, finish cutting the lines we previously drew. Cut all the way to the seam you have sewn but DO NOT cut through the seam. Open the flaps, flip the block over and press seams toward one side so they lie flat. Do not press them open. Place ontop of your previously made block and pin in place. Open the flaps, flip the block over and press seams toward one side so they lie flat. 6. 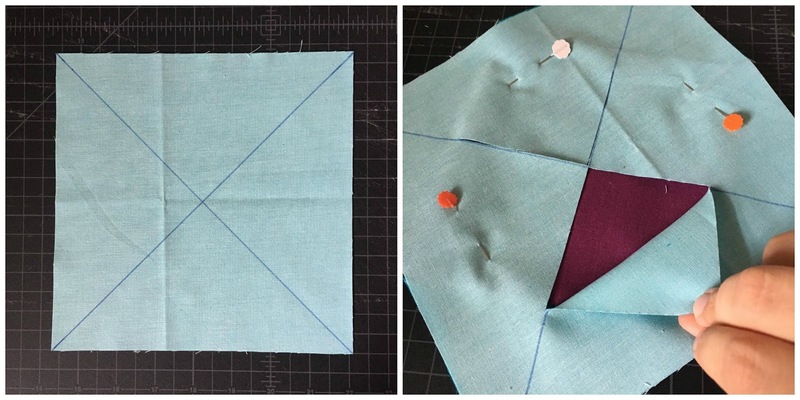 Take your two 10” x 1 ¾” Shadow strips and sew one to the top and one to the bottom of your block with a ¼” seam. Press open. Then, use your two 12 ½” x 1 ¾” Shadow strips and sew one to the left side and one to the right side of your block with a ¼” seam. Press open and you’re finished! 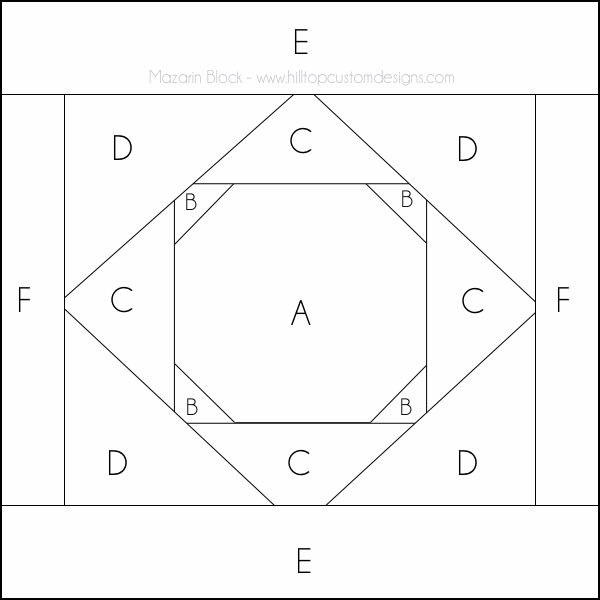 Interested in instructions for a quilt top? I've written a detailed quilt pattern for this block as well. It includes tips and tricks, fabric requirements and cutting instructions for a 54" x 54" quilt top (with borders included). I take all of the guess work out of it for you! You can purchase it from My Shop or Craftsy. Thanks for joining us! I hope you like my block, and remember if you use my tutorial please use #mazarinquiltblock or #mazarinquilt if you make an entire quilt from it. I would LOVE to see your creations! Remember, you can download and save the free block instructions. or purchase the full quilt instructions from My Shop or Craftsy. Please checkout the rest of the blog hop participates listed below..
Great design, Amista! Like what your test quilters made also! I agree, their quilts are so beautiful. Thank you! Beautiful block Amista and a very well written tutorial. I love how your pattern testers and test quilts came together; the design is great for featuring a special print in the center. Thank you so much for joining the hop! Thank you Yvonne! 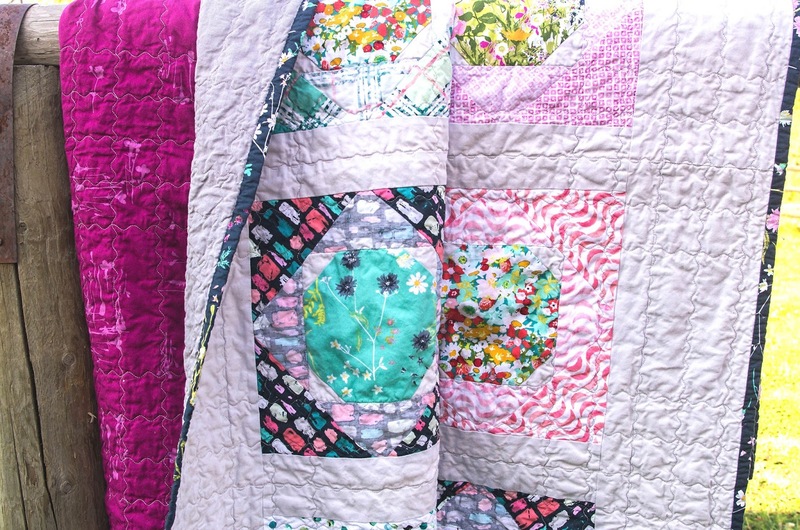 This whole New Quilt Bloggers experience and the opportunity to do this blog hop has been amazing! Thanks so much for helping organize it! It's lovely Amista, and a great way of making the block and keeping the scraps down. Great tutorial. You're right, this block is perfect for fussy cutting! Great block and tutorial, Amista! Isn't it? I love fussy cutting and I feel like this is a great way to show everything off. Thank you! You're right! 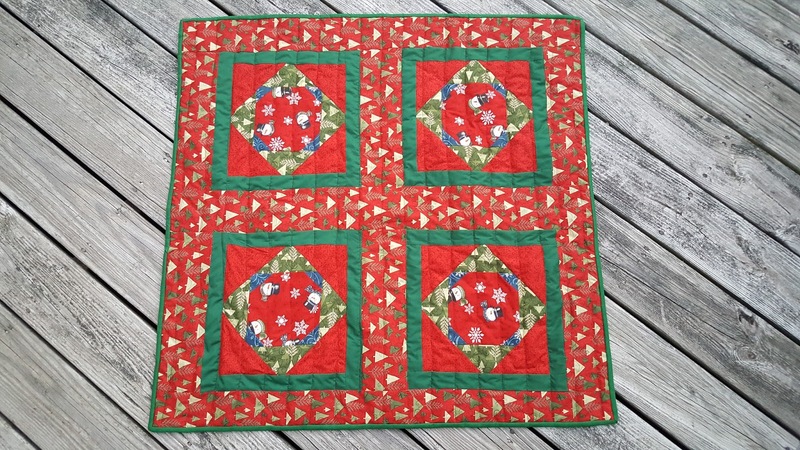 This is a great block to showcase some fussy cutting or for some amazing quilting! Nice job on your tutorial. Great block! I've never seen that method of adding triangles to the corners before...I'll have to give that a try! It looks so quick and simple. I believe its referred to as "exploding block" or something similar to that. I learned it several months ago. It seems a bit odd but is actually very easy and precise. Great job! The block and tutorial are so well done and I loved seeing all of the different versions. Thanks Cheryl! This has been such an awesome opportunity. This is a very striking block. I'm so impressed with all the talent on this hop. Thank you! I have been as well, the blocks are really amazing. How luck you bloggers are to be able to experiment with fabrics and come out with something fabulous. I agree :) It is fun for sure! Great job and great technique demonstration! This is a great block. What a super sweet block, Amista! Love seeing all the different quilts too! What a great block Amista - and a wonderful tutorial and .pdf. Your testers did an amazing job - so great to see the block made up into quilts of different colours. Nifty trick! And I love how the block comes together in a quilt top - really pretty! Lovely block and such an interesting technique! The quilts everyone made are beautiful! Aww thanks Amy, I'm glad you like it! Great looking block. Such a fun and interesting hop. I love blocks that can showcase great prints and are perfect for fussy cutting. Thanks so much for the PDFs too. 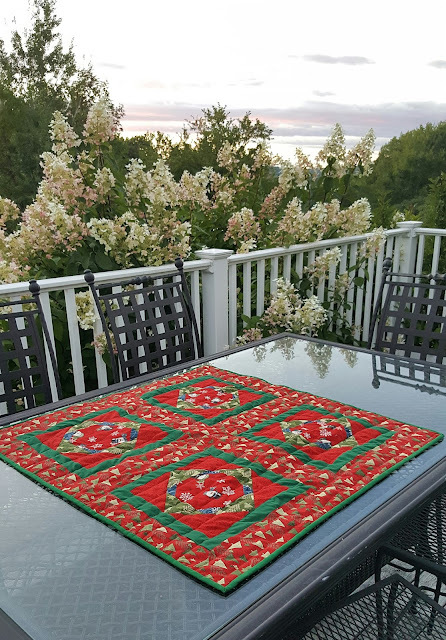 And I also like how you showed sewn quilts using your blocks with a variety of fabric. Fantastic job! Take care, Mary. So do I, and you're very welcome! :) My testers definitely did a great job. So grateful for them. Thanks Mary! I also like blocks in which I can showcase a special fabric. And no waste! Great job! I love your block. Your tutorial is great. Thank you for sharing! I agree! This is a good block design for fussy cutting. The quilts from your testers are awesome.